Cotton – Let's Go RVing! Again, a very uneventful trip today. 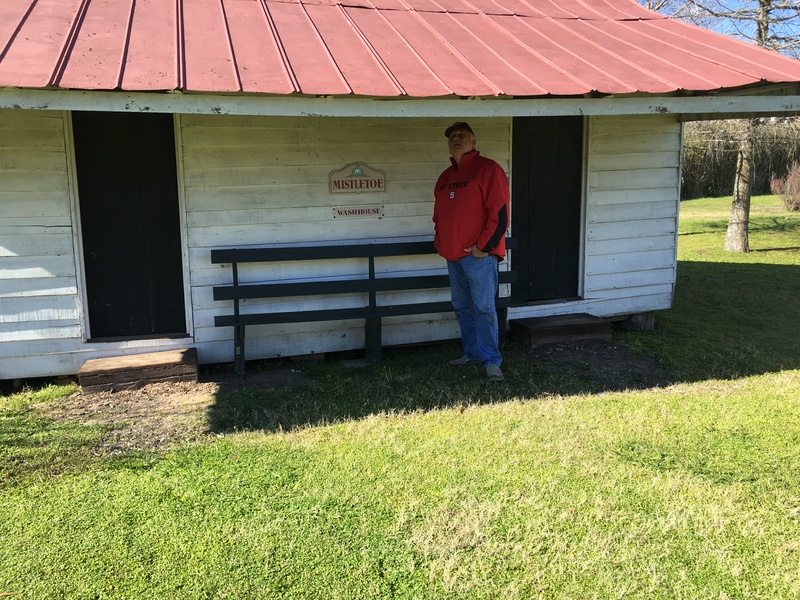 In fact as were coming into Vidalia and following the GPS, Jerry saw a sign that said River View RV Park and Resort – 3 miles. Since that was where we were staying he quickly made a U-turn by pulling into a grocery store parking lot and we were very at the park in no time. They take Passport for one night and then Good Sam’s or FMCA for the rest. They also take Escapees which is a 15% discount but we are not members of that – yet! The more we travel the more clubs we join. I estimated that it saved us a little over $40 for this visit and since we’re already ahead on the enrollment for both Good Sam’s and Passport we’re now saving money – well, you know what I mean. The park is right on the Mississippi and after I had checked us in and got back in the coach Jerry told me to look out the front window. I did and saw guys cutting grass, using the blower but really didn’t notice anything else. He said look what at what they are wearing. Well, it’s pretty cold and windy so I remarked that they were dressed for cold weather. He said, “Look at their pants” and I did and they looked a little striped. Yep, the prisoners are cleaning off the bank! Oh well, I feel secure – I guess! We checked in, got settled, had lunch and were preparing for our trip to Frogmore Plantation and then our uneventful became eventful. We suddenly lost all electricity. We checked to see if others in the park had electricity and they did so we knew it was our problem. Jerry finally remembered that a 300 amp fuse under the coach had blown last March on our first trip in this coach and Camping World came out and repaired it to the tune of $650. He remembered what they had done and repeated it by bypassing it. We can’t run the generator now but that isn’t a problem so we’re good to go for the time being. We take the coach in to Tom Johnson on the 15th for its checkup before the warranty expires on the 20th and that can be attended to then. We had earlier scheduled a trip to Frogmore Plantation at 1:30 but called to cancel it because of the electrical problem. With that problem solved we called back and they told us to come on so we rushed over there. Lucky for us because it was an excellent tour. Thus far our tours had covered sugar cane plantations but this was a working cotton plantation. Growing up in a cotton producing state one would think I knew a lot about cotton but that is not the case. I certainly did not know that cotton is a hibiscus flower! It only stays pink about a day, then blue and then the cotton boll emerges. 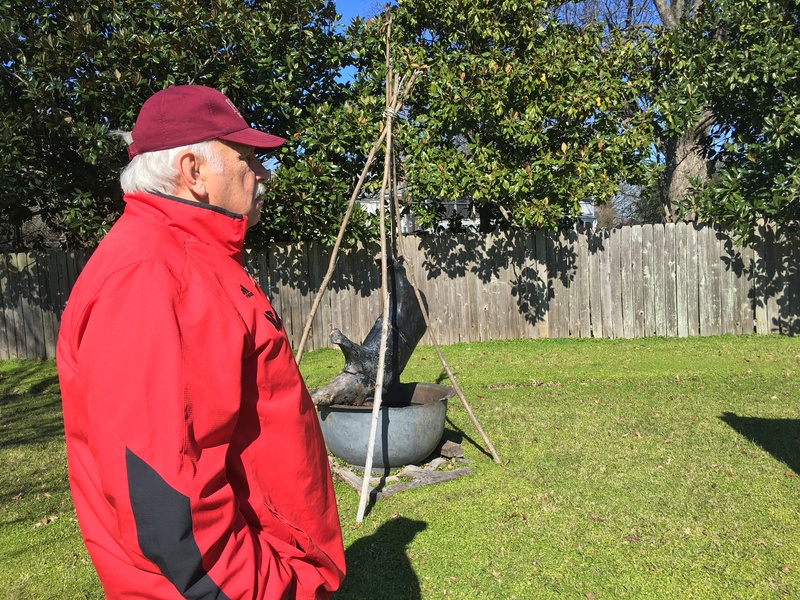 Vidalia was the perfect place for growing cotton because the silt from the floods fertilized the grounds. Natchez on the other hand, across the river became the merchandizing and social section. Families often had homes on both sides of the river. Growing cotton was a very labor intensive process and required the hands of many slaves. One building that we visited was called the washhouse or Mistletoe. That is where the weaving, sewing, spinning, clothes washing and ironing took place. On the wall were examples of the skills that the white girls learned such as tatting and crocheting. We have heard all through Louisiana about how the phrase “Don’t let the bed bugs bite” came about but today I learned that “fair and middling” came from cotton. That’s how they grade cotton and in the South when someone asks how you are doing your answer can be “fair to middling” meaning ok. I also learned that Crisco stands for crystallized seeds of cotton. Apparently cotton is in everything! When shopping I have seen sheets made with Pima cotton but didn’t realize that indicated the highest grade of cotton. When the slaves were in the field they could not return to their homes for lunch so they would take corn meal and after building a fire and heating the hoe they had been working with they would place the corn meal on the hoe and cook it over the fire, thus the name “hoe cake”. Often the slaves would sing as they worked. This served two purposes. It would set a cadence to their work giving them a rhythm. They could also be singing a warning though to any slave that might have run away. For instance Wade in the Water might signal a runaway to go to the water to hide so his scent couldn’t be detected by the dogs sent out to locate him. 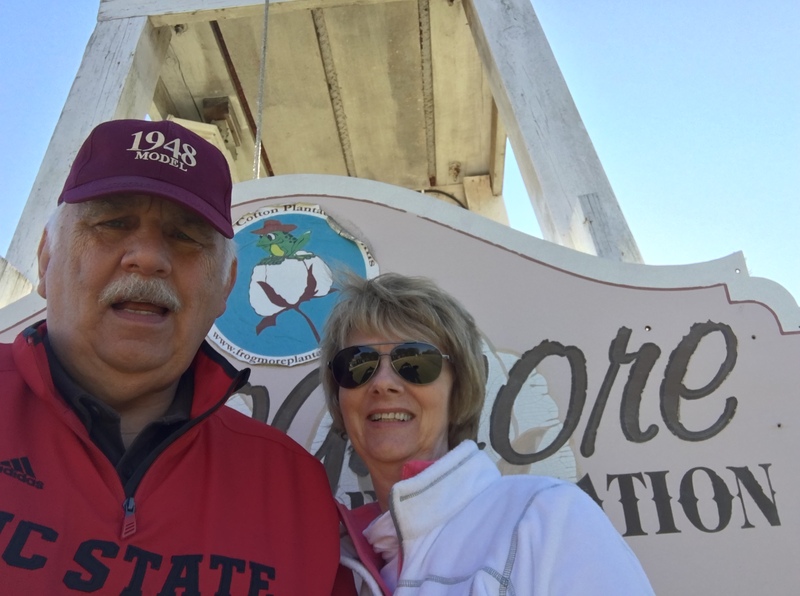 After a series of owners Frogmore was purchased by Buddy and Lynette Tanner and together they made it a working cotton plantation plus restored the original plantation by scouring Louisiana and Mississippi for the old buildings. Today it is a non-funded private, working cotton plantation open for tours through their generosity. The modern gin was also open for tours but we did not go down there. I still can’t quite believe what I did next. I got my hair cut! I had it cut the day before we left home and I was already overdue but knew that I was going to have to live with it until we got home. When I checked in the campground I asked if they knew of a local salon where I could get a trim and they suggested Hair Hut so when we left Frogmore we headed to Hair Hut so I could schedule an appointment. I got there at the right time and they took me right in and Marlene trimmed my hair! It’ll be fine until we get home plus it won’t look so bad when we go to see David and Jane for the 4D of Olivia! We had taken spaghetti sauce out this morning so for dinner we enjoyed that along with some of the delicious frozen bread we had bought in Maurice. Unfortunately we don’t have any TV as the park does not have cable right now due to the flood and because of the trees we are under the Dish cannot receive a signal. One night without TV is OK but five and one of those is the Super Bowl! Oh my!